The Clockmaker's Chambers (Clockmaker's Room in the PAL versions) is a room inside of the Old Clockworks in Luigi's Mansion: Dark Moon. The Clockmaker's Chambers are accessed by taking the north door on the second floor of the Warehouse. This room is basically a bedroom. There is a bed on a spring and a shelf with books on the right side. An alarm clock and digital clock are attached to the wall. The carpet covers a valve that can be used to adjust the time on the digital clock. The left side of the room has a wardrobe, a shelf with books and a small clock, and a desk with gears acting as legs. Several blueprints are pinned on the wall and on the desk. The door on the south leads back to the Warehouse while the door to the north leads into the second floor of the Roundhouse. 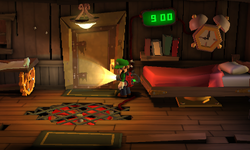 During Roundhouse Brawl, Luigi needs to go through the Clockmaker's Chambers to reach the top of the Roundhouse. There is nothing mandatory to do in this room. During Outlandish Interruption, the Clockmaker's Chambers might be one of the room infested with ghosts. Only during Roundhouse Brawl, there is a Greenie sleeping on the bed holding a ruby. Next to the bed is an alarm clock set to 9:00 and a digital clock set to 12:00. Luigi needs to vacuum the carpet up to reveal a valve. Turning this valve changes the time on the digital clock. If Luigi sets the digital clock to 9:00, the alarm clock goes off and wakes the Greenie up. After capturing the Greenie, Luigi can nab the gemstone. The digital clock in the chambers only goes until 12:00, while original clocks go until 5:00 (in the morning), meaning that this digital clock is ancient. This page was last edited on September 11, 2018, at 02:13.